Hey! Terri here with another paper-craft project and video. Enjoy! I just posted my latest tutorial to YouTube.....and it's all about cake banners! I suspect a few of you are scratching your heads and pondering what the heck this means. 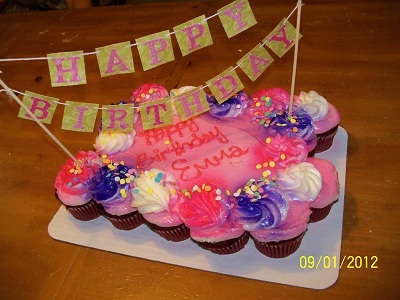 I took a picture of the banner I made for my daughter's birthday a party; I think you'll agree cake banners are awesome! I don't know why this photo insists on laying on its side! I made a video showing how easy these banners are to make. I didn't get a still photo of the baby shower cake banner shown in the video once it was on the cake, but the video has great shots of that banner. Any plans to make cake banners in your neck of the woods soon? 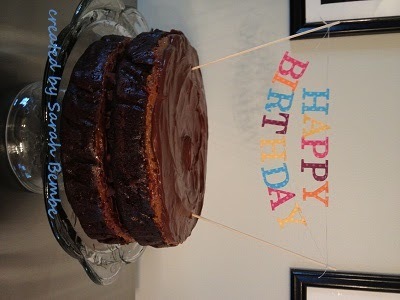 I'd love to see photos of your cake banners! September is Back to Spool time! For every $40 ordered, pick a FREE roll of 3/8" stitched satin ribbon. Orders can be placed online, in person, or on a workshop order. Details here. Shop now--my online store is open 24/7! This offer is good through 30 September so place your order TODAY! Need an annual or holiday catalog? No problem! I'd be happy to send one your way. Drop me an email with your name and address. PS--check out my stampinghare stamping tutorials on YouTube.